The portrait of Maria Feodorovna is work of art by the Swedish painter Alexander Roslin. This painting is part of The Royal Fine Art Collection of The White Palace, located in the Golden Salon. The portrait represents one out of numerous replicas of the Great Duchess` portraits that Alexander Roslin had made around 1777 upon the order Russian Tsarina Catherine the Great. In manner of late baroque decorative colours, the portrayed is the young bride of Russian heir to the Russian throne, Grand Duke Paul. 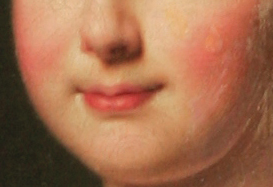 It is the half portrait of a young female figure, represented in half profile, with lifted blond hair, of a dignified aristocratic expression, dressed in magnificent late baroque costume which could be seen at the French court of Louis XV. 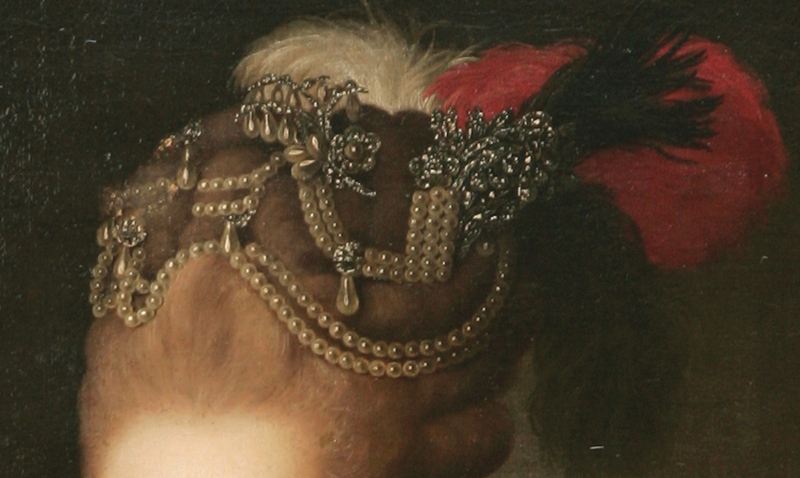 The oval face of young lady is elongated with a “crown” of thick hair decorated with pearls, silver and golden jewellery and black, olive and white feathers at the nape of the neck. The duchess` face of a regular features and large dark blue eyes is shined up with a restrained half smile that gives warmth to her face. Besides this aristocratic restraint the face of the young duchess pinpoints her kind nature. A warm look, subtle pale complexion with blushed cheeks and affable smile underline the ideal beauty of that period. 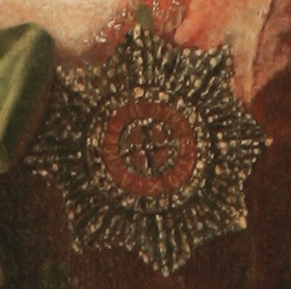 The detail that attracts attention the most is the medal of Saint Catherine represented on the chest of the Great Duchess. It is the highest order that a lady could be decorated with in Imperial Russia. Princess Sofia Maria Dorothea Augusta Louisa of Württemberg or Maria Feodorovna was born 25 October 1759 in Stettin (now Szczecin in Poland). She was the daughter of Duke Fredrick II Eugene of Württemberg and Fredericka Dorothea of Brandenburg-Schwedt. She was brought up in the spirit of French art and fashion of that period which reflected in her dignified manners and dressing. Her attitude unquestionably points to her origin and her royal rank. She adored pomp and ceremonial gatherings at the court and was a great patron of the arts. It is known that it there are 6 preserved portraits of Grand Duke Paul and 13 portraits of Maria Feodorovna. These replicas were meant for diplomatic gifts and others official gifts at the Russian Imperial court. The portrait of Maria Feodorovna by Alexander Roslin is a work of art that is in concordance with its function which is founded on the mechanism of diplomatic gifts. The diplomatic gifts with accompanying expressions of courtesy and respect were crucial part of desirable conduct in circles of European rulers. The painting has a gilded wooden frame decorated with floral lace motives in a technique of woodcut. Born in 1718 in place Malmö, Sweden, Roslin obtained was educated in Stockholm. Roslin’s talent was obvious. On his study journey in 1745, as a 27-year- old he was appointed master painter of the Academy of arts in Bayreuth. From that period originates his series of pastel portraits of court musicians from the Music Salon Neues Schloss in Bayreuth. Two years later he travelled through Italy where he made friends with aristocratic circles and artists like Giuseppe Baldrighi and François Boucher. When Rosslin’s arrived in 1752 in France, Boucher became his best friend and associate. His work was well accepted by audience. He also knew very well Joseph Marie Vien who was his best man at his wedding. Very soon Roslin decided to stay in Paris and became one of the best known portraitists in the high circles of France. Although his official portraits like the one of Louis Philippe Duke of Orleans (1757) depict coldness and pomp, his work reaches a peak in informal pieces like the portrait of architect Jean Rodolphe Perronet and his wife where he exerts talent of detail representations. Similar artistry he demonstrates in representations of a psychological state of an individual. In 1753 Roslin became a member of the Royal Academy. 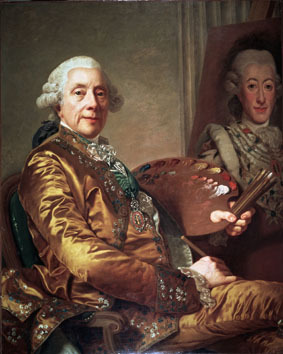 In 1771 Roslin paid a visit to King Gustav III of Sweden when he painted the portraits of his Royal Family. Delighted with his work King Gustav III decorated him with the royal knight medal Vasa. 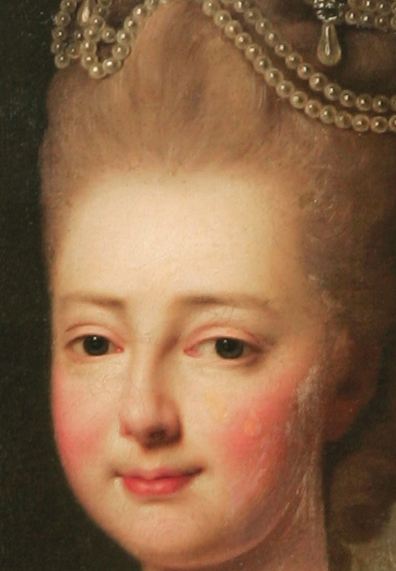 On the recommendation of King Gustav III who had good relationship with the Russian Tsarina Catherine the Great, Roslin arrived in Russia in 1775. Rosslin’s stay in Russia was not for long, just a few years, but it was very productive. He had already received in 1760 an invitation from Tsarina Elisabeth to come and paint portraits at the Russian Imperial Court. However, being popular in the high circles of Paris he turned down the offer. In contrast to Elisabeth, Tsarina Catherine II, from the moment of her assuming the throne, was thirsty for everything that was highly desirable in France, hence Roslin received a new invitation. 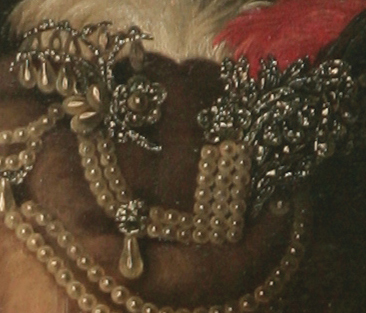 He was at the time in his country painting the portrait of King Gustav III. This time the offer came through the Russian ambassador in Stockholm and Rosslin accepted it. During his two years at the Russian Court, he witnessed numerous important events. During this period he made portraits of the Tsarina, close friends of her son Grand Duke Paul and portraits of his second wife Maria Feodorovna. Two years after his arrival (1777) Roslin wrote that the whole Imperial family ordered copies of their portraits. Upon the arrival of Maria Feodorovna at the Russian Court, Roslin with true excitement painted the young bride. With her point of view and insistence on ceremonial dress code Maria Feodorovna became the ideal model of the Swedish painter.